If you break down on the motorway, you should make your way safely to the hard shoulder at the very first sign of trouble – although the AA remind drivers that the hard shoulder is only for these kinds of emergencies, not for toilet stops or stretching your legs. Once you’re on the hard shoulder you should put your hazard lights on and turn the engine off. If it is dark or visibility is reduced, then leave your side lights on too. Exit your car via the left hand doors, and move all your passengers over the barrier of the hard shoulder and up onto the verge; as far away as possible from the road without losing sight of your car. If you have high visibility jackets then put these on, to help keep you visible to drivers passing by. Getting yourself and your passengers off the hard shoulder and as far away as possible is the most important safety move to remember if you break down on the motorway. It will help keep you far enough away in case your car catches fire, or should another vehicle crash into it. If you have a disability and are unable to leave your car, then keep your seatbelt on, hazard lights on and call the emergency service or your breakdown service as soon as possible, telling them that you’re in the car. Next, use your mobile to call your breakdown service provider to come to your rescue. If you don’t have a mobile phone to hand, follow the signs on the posts at the back of the hard shoulder to the nearest emergency telephone located at your side of the motorway. The phone is free, and will connect you directly to the police. If you can’t get to the hard shoulder then place your hazard lights on and stay in your vehicle with your seatbelt on and call the emergency services. Unless you can be 100% sure it is safe to get out of your car and get to the hard shoulder, you should remain in the car. You should never attempt to fix your car yourself when on the motorway/hard shoulder. Always wait for assistance. A smart motorway is one where the hard shoulder has been turned into a traffic lane, and instead has emergency refuge areas. If you break down on one of these, then you should do the same as above – except find an emergency refuge area, motorway services or the next junction that you can safely move to, before pulling over. If you stop in an emergency refuge area, you need to use the SOS phone to contact Regional Control Centre once you stop, and before you leave. If you break down on a road then you need to move your vehicle so it is off the road, but be aware of any soft verges that may make it harder for you to leave after. You’ll need to put your hazard lights on, and use sidelights if it is dark or poor weather. Again, as if you were broken down on a motorway, try and distance yourself from the car and any moving traffic, to protect yourself and your passengers. Always vacate your car on the left hand side, and try to not open your door to the facing traffic. If you have one, and you are able to, place a warning triangle forty-five metres behind your vehicle. This will help alert drivers that there is an obstruction ahead, and to slow down. Use your mobile phone to call your breakdown services and provide them with your exact location. We would strongly recommend that you purchase a breakdown cover service for your car, to cover you on any occasion that it might break down. It will help to give you peace of mind should something go wrong, no matter whether you’re just popping to the shops or work or driving a longer distance. 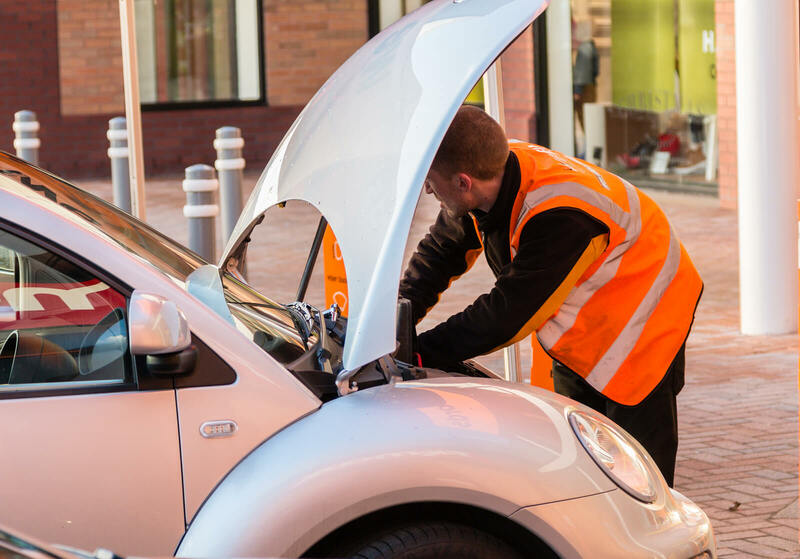 Summer is a key time for breakdowns due to cars overheating, with the RAC reporting a 20% increase in call outs during hot weather. Make sure you check your coolant levels regularly during the summer months, as well as topping up your oil if necessary. You could also have your cooling system checked out by a reputable garage to make sure that it’s operating well; a faulty cooling system could make your car overheat, and even cause engine damage.